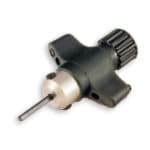 Toggle Bits, or sometimes referred to as key bits or stems are an integral part of modern day die fixing tooling. Toggle bits work in conjunction with a toggle key; they are inserted directly into the central recess of a key and secured tightly with a fastening grub screw(s). The tooling outcome allows a machine operator to tighten the screw inside a toggle hook body to securely fix a die to a honeycomb plate. You can view more information here regarding our die fixing toggle hooks range. Toggle Bits are the tooling link between the toggle screw and the key itself. Different manufactures of toggle hooks and toggle bits use different sizes based on their designs and requirements, so not all tooling is cross compatible between brands. 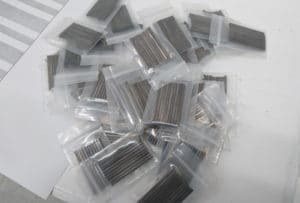 The bits themselves are under constant strain during the use, so they are considered as a consumable. By offering a non-permanent fixation to the toggle key, it means the key can be re-used as and when the bit eventually breaks. Profoil’s toggle bits have been designed to work in conjunction with the Profoil Original and Premium Toggle Hook ranges, so customers don’t require new bits when handling different toggle hooks used across a range of machinery. 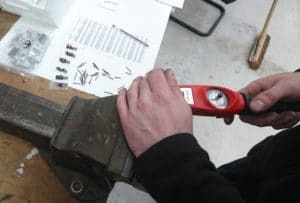 However, it’s important for machine operators to be trained in the use of toggle hooks, how they are secured to honeycomb plates and importantly, how the toggle bit tooling should be carefully used by hand pressure. Although simple in appearance, toggle bits remain a difficult part for manufacturers to get right. Material hardiness is usually a focus point for inexperienced manufactures. In most manufacturing processors for carbon-based steels, the harder the material is, the less tensile the outcome can be, and this can result in a harder material but often breaks very easily under strain due to brittleness. Profoil’s current toggle bits are our most impressive and consistent toggle bit since production of the die fixing range commenced over 15 years ago. Through newer metal fabrication processors, improved consistency is achieved, which is verified through extensive testing. After each manufacturing batch, a test percentage of bits are tested to the limit and finally broken. The test process records the degree of flexibility in the material and the final break point with a Newton metre equipment. Results are recorded and analysed before the bits are for sale. Profoil toggle key bits are sold in packs of 10 and very competitively priced.